Teetering piles by the bed. I usually have several books on the go at once and each one has its place. The Bath book stays in the bathroom, it needs to be a paperback, preferably second-hand, because it will get wrinkly. Kate Atkinson, Will Cohu, Sebastian Barry, Dervla Murphy and Philippa Gregory have all joined me in the bath at some point. The Car/Train book is separate but similar as it needs to be stuffed into a handbag or a glove compartment. The teetering and increasingly dusty pile by my bedside is a bit more eclectic in subject and format – there’s a backlog because unless the book is really gripping I fall asleep after only a few pages. Recently I have been dropping Christopher Lloyd’s The Well-Chosen Garden on my nose. I only ever met “Christo” once, at the time his weighty Garden Flowers was my bedside book and he laughed at the idea of my doggedly reading through it at great personal risk. 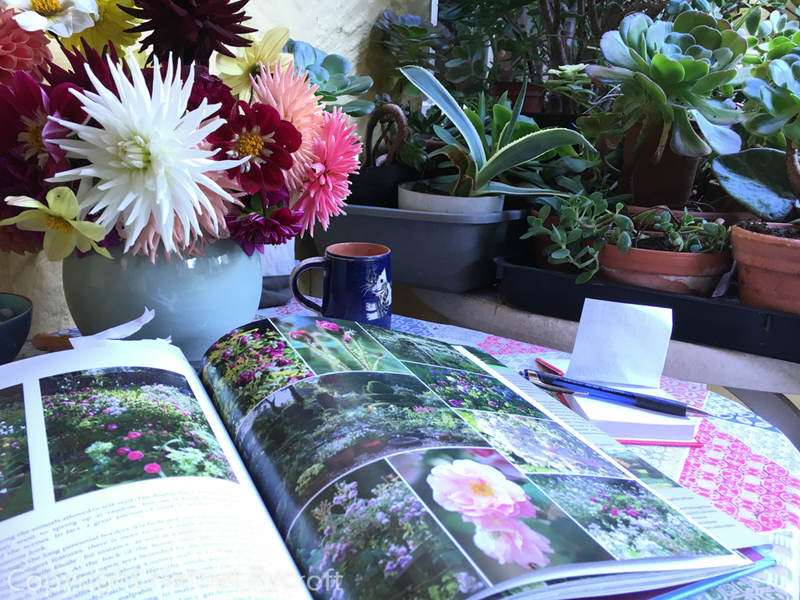 When selecting the next bedtime read I normally alternate gardening with either fiction, history or nature writing but this week I am making an exception by following Christopher Lloyd with Roy Lancaster’s My Life with Plants. I have seen Roy speak many times and have had the pleasure of meeting him on a few occasions. He’s always worth listening to. I once saw him give a talk about Bhutan so full of passion for plants and love for the country, its people and flora that his were not the only eyes glistening with tears by the end. I met him most recently when he came to The Cotswold Wildlife Park to speak and kindly agreed to join members of the AllHorts FB group there for a walk-and-talk in the gardens with us and Tim Miles the Head Gardener. 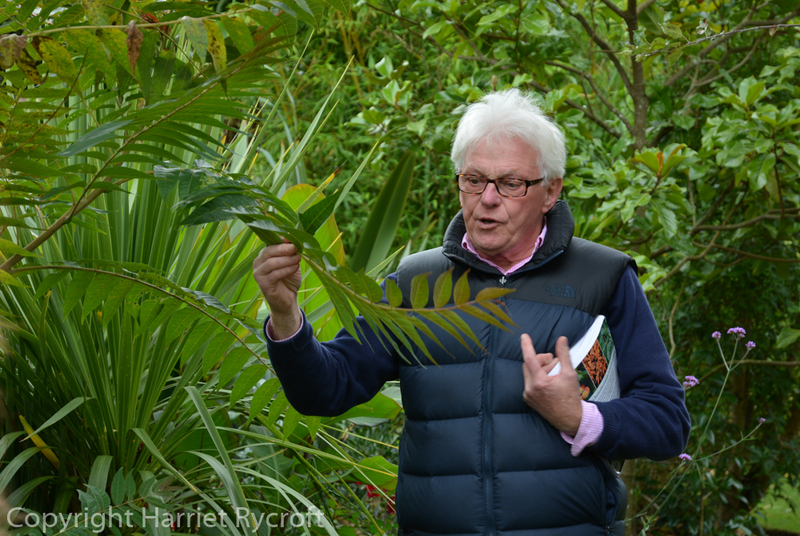 We hung on his every word – you just have to point him at a plant and out come wonderful stories about its origins, its uses, the people who introduced it to the UK, seeing it in the wild… Roy is the king of the horticultural anecdote, so enthusiastic and full of fun – the stream of information about plants was only interrupted by turning to wave at the children passing on the little train which runs round the park. He wanted to be an engine driver when he was a nipper but horticulture was a more level-headed career choice. We all queued to buy his book and ask him to sign it because he is living proof that it can be a pleasure to meet your heroes. I have learned over the years that I always regret passing up an opportunity to get a book signed, even though you can feel like a bit of a twit for asking. 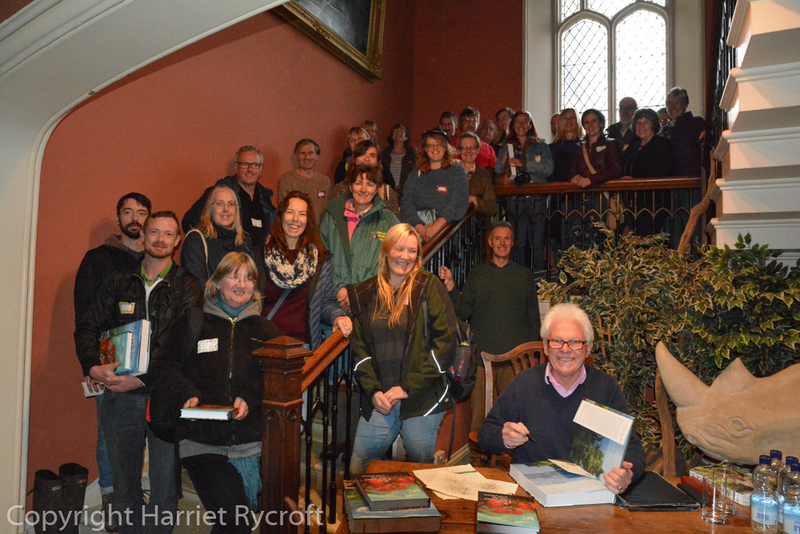 My Life with Plants is so far just as I had hoped, warm, humorous and full of botanical detail. You can hear Roy’s voice. It turns out that I am reading it in the week of Roy’s 80th birthday, the event this memoir was intended to mark. Happy Birthday! Meanwhile downstairs I have a Kitchen Table book, which sometimes ends up in the garden room (sounds posh but it’s a glorified porch) because it’s lighter there. At the moment there is no KT book because the tables have been covered in plants. I’m sure many of you have the same problem. Anyway, the KT book is usually a garden book because so many of them are vast, so heavy that reading them in bed is definitely inviting serious injury. I was sent a review copy of Secret Gardens of East Anglia a while ago and it turned out to be the perfect KT book, not so huge that it gets in the way of my coffee but big enough to lie open comfortably. 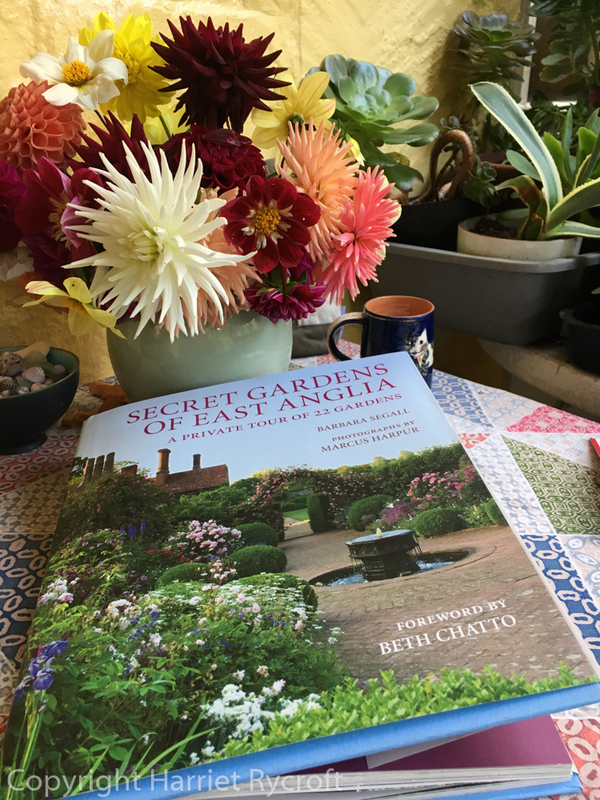 I was delighted to be given this book because it was one I genuinely wanted to read, written by Barbara Segall, with insightful photographs by Marcus Harpur, who sadly died this year, a great loss to the celebration of gardens and to the horticultural community generally. I only ever met Marcus once, at the Garden Media Guild awards (GMGs), I was relatively new to the world of garden media, terrified and consequently a little too drunk, the room was also deafening. I failed to have a proper conversation with him. The wonderful thing about social media, however, is that when you’re feeling brave enough you can speak to the people whose work you admire and even tell them so – something you should do, even if you risk sounding like a creep. I did this when I saw the cover of Secret Gardens of East Anglia on Twitter and his reply was characteristically modest, giving all credit to the creators of the gardens. I’m glad I spoke up because he was gone not long afterwards. I was also glad to see that he was posthumously awarded the Book Photographer of the Year Award at this year’s GMGs. I don’t get to that side of the country very often but this has made me determined to have an expedition next year. I know the glories of Ulting Wick well and have seen the amazing wisteria at Wickham Place Farm, I have peered wistfully through the gate at Hemingford Grey and East Ruston Old Vicarage has been on my Must Visit List for a long time but there is so much more, at least 18 more gardens according to this book, and all their contact details are usefully listed at the end. 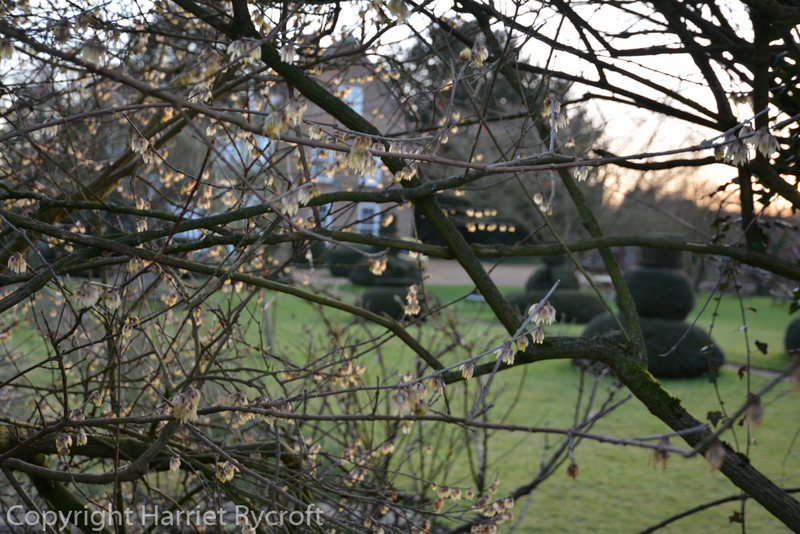 Peering wistfully through Chimonanthus praecox at the famous Hemingford Grey topiary. One day I’ll visit properly. 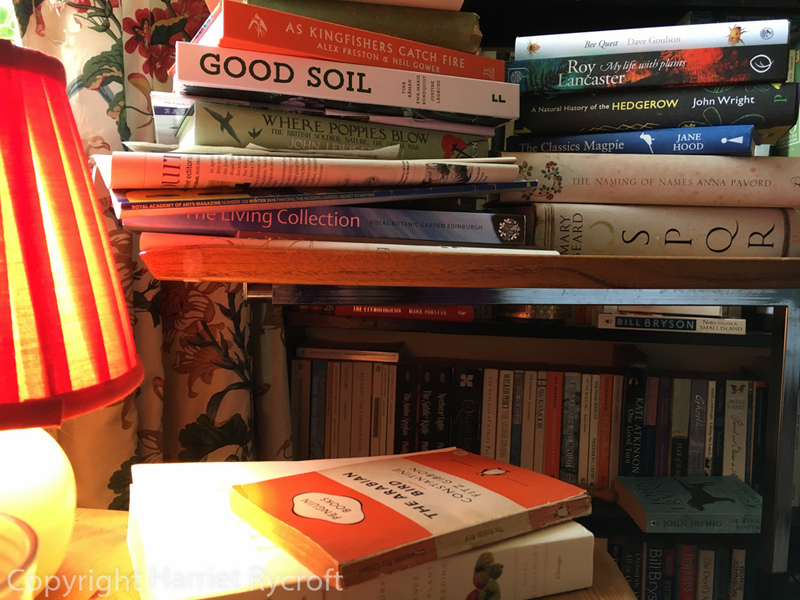 My gardening books. Together at last. My husband Chris and I used to share a room of our house as a sort of study/library but now that our boys have left home I have colonised a little room upstairs and left the original room to Chris. This makes us both happier because he is tidy and systematic and I am… not. My room is a little nest of scattered papers, pinned up postcards and dog-eared exercise books. It is still painted red orange and yellow, the colours chosen years ago by a seven year old. The walls are scarred by blu-tack but I like it as it is. 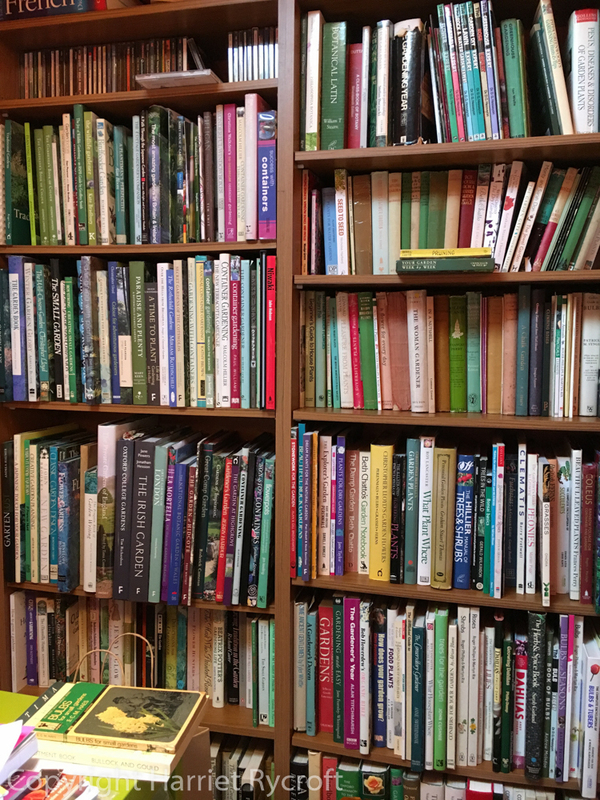 Now my gardening books are relatively tidy (it won’t last) and all together for the first time. 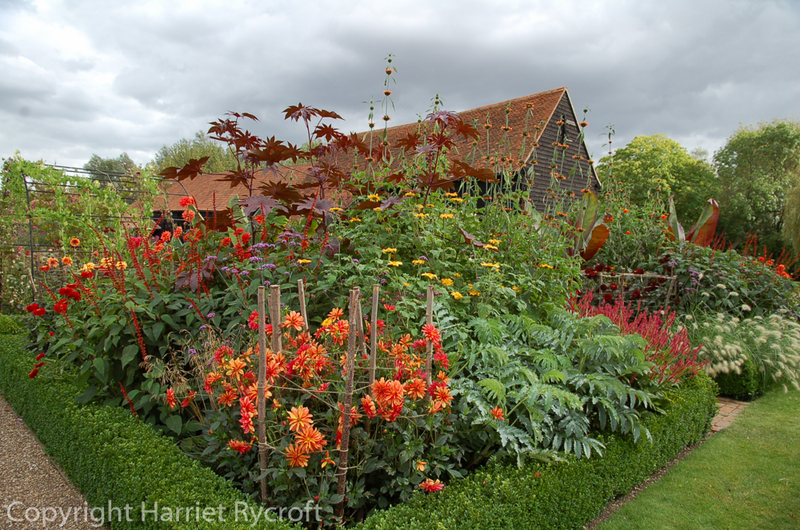 The Gardens of East Anglia are snug between The Irish Garden (Jane Powers) and Great Gardens of London (Victoria Summerley). Soon Roy Lancaster will be cheek by jowl with Christopher Lloyd and Beth Chatto. As I look at their spines I feel no guilt about the unread majority, I just see potential, and the certainty that I need never be bored. Many are by people I have met or hope to meet, which all adds to the pleasure and I refuse to be cool about it! Hi Jo! I really should read the pile in strict order of arrival but a big part of the pleasure and privilege of having lots of books is deciding what to read next. As for admiration, well Garrison Keillor said in one of his books that if you like someone’s work don’t feel silly letting them know, you are doing them a favour even if you think they must have heard it all before. Not long after reading that I saw Garrison Keillor in a gallery and did I summon the nerve to speak to him? Of course I didn’t! I’ve been trying to make up for that ever since. Hi Sharon, glad to see you in this location! I’m so sorry to hear about your father though.